A slightly quirky theme this week…. I thought that sounded like a good challenge. Where I decide each day to exercise the challenge will be arbitrary and whilst I may take 10 pictures I will only post one. For those of you not into metric – 10 meters = 32.808399 feet – so I’ve got a bit of distance to play with considering I can go 10 meters in any direction from where I am. Today we were in The Curve, Leicester’s state of the art theatre, designed by world renowned architect Rafael Viñoly. A difficult building in which to take photographs as it is continuous curves in all directions. I liked these lights the best in the end. The Curve is based in the heart of what the City Council calls the new “Cultural Quarter” on Rutland Street. Curve features two auditoria, one with 750 fixed seats while a 350 seat auditorium provides a versatile smaller space with its own power flying system. When the 32 tonne steel walls separating the stage and the foyer are lifted, the stage is visible from street level. The glass façade encloses an open plan foyer with views onto the café, bars, backstage area, and across the stage. It’s early morning and The Boys are doing their ‘bits’ in the garden of our friends we are visiting. 10 pictures within ten metres seems a good idea. The morning sun is low and bright. Lots of pictures of water droplets on leaves which insisted on moving slightly in the breeze. 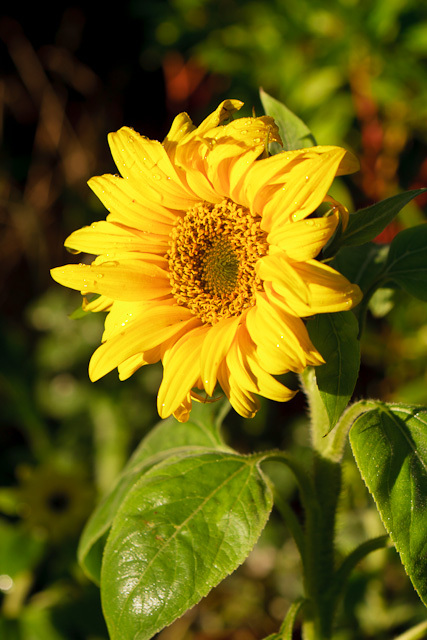 I liked this sunflower sat proudly in the morning sun. By rights it should be dead and withered by the autumn frosts, but it has survived to enjoy another dawn. 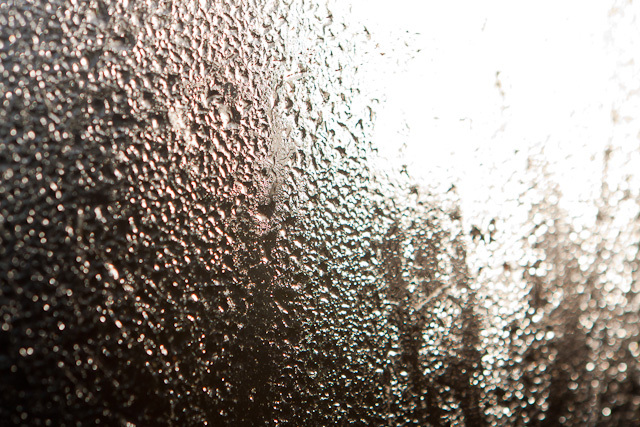 I also quite liked the condensation on the greenhouse glass…. Gales and rain made for a lot of opportunities in Sheffield tonight. This is Tudor Square in Sheffield, home of the Crucible Theatre, famous for its annual hosting of the World Snooker Championships. The square is home to the largest concentration of theatres in the UK outside London and has thus become known as Sheffield’s ‘Theatre Land’. The Square lies at the heart of the city centre, only metres away from the town hall, major attractions such as the Winter Gardens and is only 5 minutes away from Sheffield railway station. Tudor Square has always been home to theatres. The Lyceum, Sheffield’s oldest theatre, sits on the east side of the square. 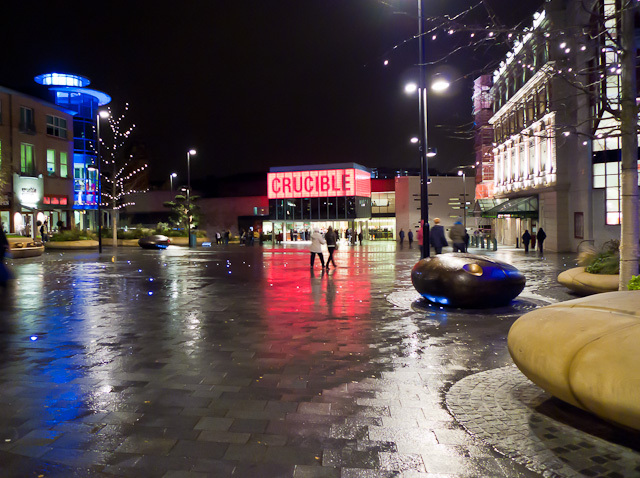 On the north side of the square is the Crucible, the venue for the World Snooker Championships since 1977. Also within the square is the smaller Studio Theatre which, along with the two aforementioned theatres, is managed by Sheffield Theatres. Tudor Square has recently been modernised with funds provided by the European Regional Development Fund. For the project £4 million pounds was allocated to redevelop the square to coincide with the refurbished and redesigned Crucible theatre. The aim of the project was to provide Sheffield Theatres Trust with a open public space for cultural activity and create an impressive new gateway to the city. The newly designed square was opened in 2010. The refurbishment of the Crucible theatre cost £15 million to complete. The aim of this particular project was to improve the night time economy of the city centre, something which the theatre has done so for its entire history. The redevelopment will, amongst other things, provide a much improved venue for the world snooker championships which are held there annually. Kairen is now convinced that I am in the early stages of senility. Ten photographs in the garage seemed OK to me, but has her shaking her head. Whilst there were plenty of photographs taken, somehow drill bits, saws and tyre inflators didn’t do much for me either. 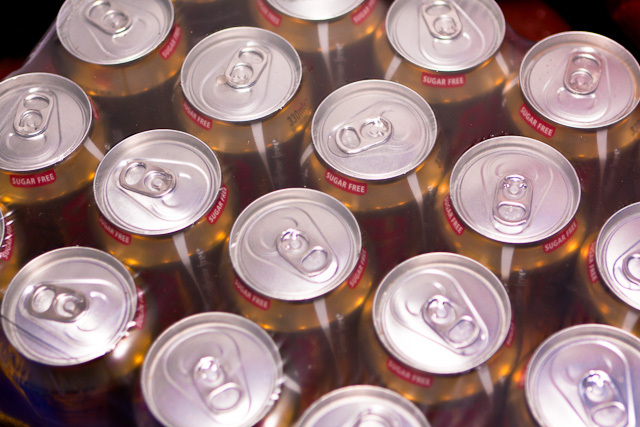 I quite liked this flat pack of caffeine free coke.